On March 10 at approximately 11:50 a.m., Calcasieu Parish Sheriff’s Office deputies responded to a call in reference to two young children outside and unattended on Southern Meadows Drive in Lake Charles. Upon arrival, deputies observed a 1 year old child, who was unclothed, and 4 year old child running across the street into a neighbor’s yard. 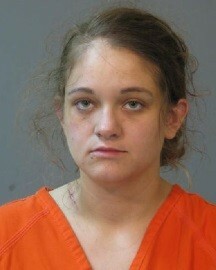 Deputies located the mother, Kari D. Gibson, 24, who was inside her home with her 5 month old. When deputies spoke with Gibson they observed her to have slurred speech and unsteady balance. Gibson stated to deputies that she had drank alcohol and used various illegal narcotics earlier the same morning. During further investigation deputies received permission from the home owner to search the home. Once inside deputies located numerous drug paraphernalia items as well as a clear plastic bag of marijuana, a partially burnt cigarette containing marijuana, a bag containing synthetic marijuana and several Xanax pills. Gibson was arrested and booked into the Calcasieu Correctional Center and charged with 3 counts of cruelty to a juvenile; 3 counts of illegal use of CDS in presence of juvenile; possession of CDS IV; possession of marijuana; possession of synthetic marijuana; and possession of drug paraphernalia. Judge Michael Canaday set her bond at $55,000. CPSO Deputy Sr. Cpl. Mark Rosteet was the arresting deputy on this case.